Harry Potter is coming out next week. So. Freaking. Excited. I mean, I am reading, errrm listening to on tape, all the Harry Potter books in preparation. I'd like to say I'm going to watch the movies too but seriously, I have a life people. As I blog I'm on The Chamber of Secrets, somewhere around 11 minutes into chapter 15. So if I randomly type an "alohamora!" or "but 'Arry!!! ", please, don't be alarmed. Even though I've been listening to HP non-stop, I've still been eating. Can you think of anything better than listening to Stephen Fry while eating some tabbouleh? I didn't think so. I made this a week or so back soon after I received my first CSA box. I had a bunch of new & fancy ingredients as well as a well stocked pantry. Pouring through my surplus of cookbooks, I came about this recipe. If you've ever gone to a hot bar with me at Metropolitan Market, Whole Foods, PCC…etc, you know I ALWAYS get tabbouleh. ALWAYS. However, I had never made it at home before. Nor have I ever bought Bulgar. You'd think I would but no. I don't always think ahead. But when I saw that I had all the ingredients for a this recipe, I'm pretty sure I squealed with joy. The ingredients are fairly adaptable, but I'd try and stick to the more traditional ingredients as much as possible. I also increased the amount of parsley and lemon juice so if you aren't a fan of these, feel free to reduce the amount. Rinse and drain the quinoa in a fish mesh strainer. In a medium sized sauce pan, bring the quinoa, water and salt to a boil over high heat. 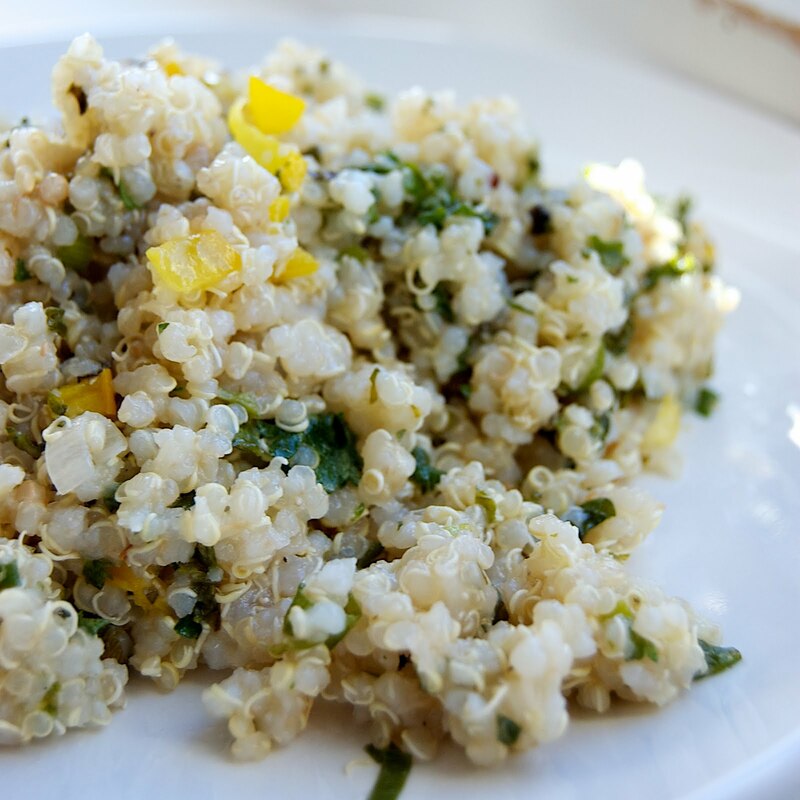 Reduce the heat to low, cover and simmer until the water has been completely absorbed (however, you don’t want to it be ­dry) and the quinoa is tender. This should take about 15 minutes. Fluff with a fork, transfer to a bowl and set aside. While the quinoa is cooking, finely chop the bell pepper, tomato, parsley and mint and mince both the scallions and garlic. Add them to the serving bowl with the cooked quinoa. Pour on the lemon juice and olive oil, mix well. Add salt and pepper to taste. Can be served both warm or at room temperature.